Have been fishing in the online places for a bit. When buying a couple of job lots, some unexpected, different species show up in the net. Not what the lot was being hauled in for, but these do give a nice puzzle to figure out what they are. From online references and from the context that they're found in, most of these could be determined. A set of lower wings with a full set of struts and even bolts. Not sure the nuts are original, but the bolts look the right type. 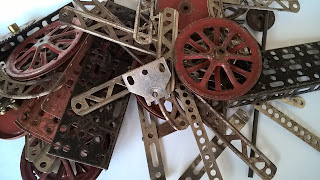 This would be part of a French made 'Aeroplane Constructor' set by Meccano. The thin, green corner gusset or architrave on the right is a 'Primus Engineering' part. Same half-inch hole spacing. These were steel and wood construction sets, made from 1913 to 1926. Given that they went out of business in '26, these gussets are surprisingly common in British lots. The nickel part on the left is much thicker and of the Meccano pattern, but not stamped with Meccano anywhere. It may be an early part, not yet stamped, or it might be from another manufacturer. The red disk on the right has a half-inch hole spacing, with Meccano-sized holes. Most likely this actually is a Meccano part, from their short-lived X-series. Then this would be a part number X475. The disk to the left with differently sized holes is not yet identified (Primus?). Very common in North America, less so in Europe. 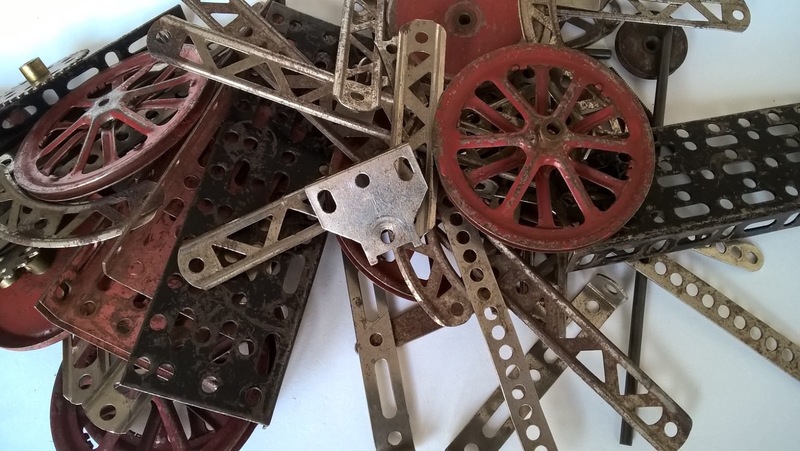 A jumble of A.C. Gilbert Erector parts. From the design of the parts, the closed disk wheels and the 'trunnion' bearing, these parts are late twenties through mid thirties. The seller of the job lot this came from knew that relatives from the US would visit during the 30-ies. Quite possible brought over as a gift then. Very common. 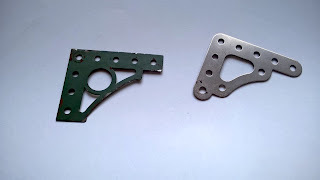 A small selection of Trix parts. These are mostly late thirties to late forties bits-n-bobs. The Trix sets were comparatively cheap - not compatible in hole spacing, but a few bits seem to be mixed up with most lots. These long, strong strips are not marked and are in design identical to the Meccano design. The pale green color suggests these could well be Märklin parts, likely from the thirties. Almost Meccano then, as Märklin ended up owning the German operation of Meccano after the first world war. Tinplate train wheels. Odd that, not usable anywhere, really. The small diameter are most likely from a thirties O-gauge tinplate train (Hornby?). Now to see how to dispose properly of these... Probably the online marketplace again, though if anybody's interested do say so.